Impaired APC functions may play important roles in chronicity of hepatitis C virus (HCV) and HIV infections. To investigate the separate and combined effects of HCV and HIV infection on immature dendritic cells (DCs), we evaluated myeloid-derived DC (MDC) and plasmacytoid-derived DC (PDC) frequencies and functions, measured by Toll-like receptor ligand-induced IFN-α and IL-12, in healthy controls and subjects with chronic HCV, HIV, and HCV-HIV infection. To evaluate the relation between innate and adaptive immunity, we measured HCV-specific IFN-γ-producing T cell frequency. MDC frequencies tended to be reduced in HIV infection (1.8-fold), while PDC frequencies were minimally reduced in HCV infection (1.4-fold). In contrast, a striking reduction in non-PDC-associated IFN-α production was observed in HIV-infected subjects (17-fold), while PDC-associated IFN-α production was markedly reduced in HCV-infected subjects (20-fold). Both non-PDC and PDC functions were impaired in HCV-HIV coinfection. MDC-associated IL-12 production was markedly reduced in both HCV and HIV-infected subjects (over 10-fold). Functional defects were attenuated with slowly progressive HIV infection. The proportion of subjects with HCV-specific T cell responses, and the number of Ags recognized were reduced in HCV-HIV subjects as compared with HCV singly infected subjects. A positive association was observed between MDC-associated IL-12 production and HCV-specific T cell frequency in HCV-infected subjects. These results indicate that immature DC function is dysregulated in HIV and HCV infections, but differentially, and that these defects are attenuated in slowly progressive HIV infection. These selectively different impairments may contribute to the reduced adaptive immune response to HCV in HCV-HIV coinfection. There are over 3 million Americans chronically infected with hepatitis C virus (HCV).4 These individuals are at increased risk of developing cirrhosis, liver failure, and hepatocellular carcinoma (1, 2). HIV infection appears to alter the course of HCV-related disease, accelerating rates of progression to cirrhosis (3, 4, 5). Additionally, HCV infection has emerged as a cause of increased morbidity and mortality in HIV-infected individuals (6, 7). Despite a high prevalence of HCV-HIV coinfection, the interrelationships between these viruses are not completely understood. The T cell response directed at HCV-derived Ags in the infected host is thought to be important in the pathogenesis of HCV-mediated disease, associated both with favorable clinical outcome as well as organ damage (8, 9). Additionally, effector dysfunction of HCV-reactive T cells has been proposed to contribute to the frequent persistence of HCV infection (10, 11). It appears that in chronically infected individuals, this dysfunction may be specific for HCV (10, 12, 13, 14). Moreover, we have previously found that CD4 cell responses to HCV are reduced in magnitude in individuals coinfected with HIV when compared with HCV singly infected individuals (13). The mechanism for this additional impairment, though potentially due to reduced CD4 cell numbers in HIV infection, is not clear. In contrast to HCV singly infected and HCV-HIV coinfected subjects with progressive HIV disease, we have also previously found that HCV-HIV coinfected subjects with slowly progressive HIV disease have higher frequencies of HCV-specific CD8 cells than observed in HCV singly infected individuals (14). HCV-HIV slow progressors also tended to have lower HCV plasma levels than did HCV-HIV-infected subjects with progressive HIV disease. One possible mechanism for T cell effector dysfunction in HCV infection is abnormal priming and stimulation of HCV-specific T cell populations by dysfunctional APC populations. Dendritic cells (DC) are a distinct population of bone marrow-derived leukocytes that are capable of directing the magnitude, polarity, and effector function of the T cell response (15). This is possible because DCs possess pathogen recognition receptors, Ag capturing and processing machinery, and costimulatory molecules which allow them to act as professional APC. Immature DC are efficient at Ag uptake (16). Once activated, they are capable of efficiently migrating to lymphoid tissue and priming T cell responses. Mature DC, in addition to expressing necessary costimulatory signals, also secrete IFN-α and IL-12, which facilitate the effective priming of human type 1 cytokine-producing T cells (15, 17, 18, 19) and resistance to viral infection (20). DC precursors have been characterized by cell surface phenotype, and have been divided into two subsets (myeloid-derived DC (MDC) and plasmacytoid-derived DC (PDC) or immature MDCs and PDCs) (21). MDC are myeloid derived and in general are characterized by expression of CD11c, HLA DR, GM-CSFR, CD13, and CD33, and a lack of expression of IL-3R (CD123) or lineage marker expression. PDC are plasmacytoid derived and are characterized by the expression of CD123, and a lack of expression of CD11c or lineage marker. This latter cell type had initially been shown to be a dominant IFN-α-producing cell type upon viral challenge (22). However, other DC subtypes are also capable of dominant IFN-α secretion during viral infection (23). Initially, MDC and PDC were thought to prime primarily type 1 and type 2 T cell responses, respectively (21). However, subsequent data suggest that function (priming of type 1 vs type 2 responses) may vary with time between Ag exposure and presentation (24), and that PDC are capable of priming type 1 responses in an IL-12 and IFN-α-dependent fashion (18). Thus, circulating peripheral MDC and PDC populations can mature to DC populations capable of IFN-α and IL-12 secretion, and efficient priming of type 1 responses that may be important for control of chronic viral infections such as HCV and HIV. Reduced numbers of PDC populations have been observed in HIV-infected individuals (25, 26, 27). These numbers are more markedly reduced in subjects with AIDS, and PDC number has been found to inversely correlate with HIV viral level and CD4 cell count, suggesting that these cells may be important in the control of HIV, or that they are reduced as a result of more advanced HIV disease (27). Furthermore, HSV and influenza-induced PDC IFN-α secretion has been found to be reduced in HIV-infected subjects (25, 26, 27). This IFN-α-producing function has also been found to inversely correlate with plasma HIV levels, suggesting the possible importance of this function in the control of HIV (25, 27). Additionally, MDC numbers have been found to be reduced in HIV-infected subjects (25, 26). In one study, MDC number was reduced in HIV-infected subjects with higher plasma viral levels (>5000 copies/ml), and MDC number was inversely associated with plasma HIV levels, again suggesting the potential importance of MDC number in the control of HIV (26). In addition to an IFN-α-producing deficit, APC from HIV-infected subjects are reduced in IL-12-producing function (28, 29). Therefore, it appears that MDC and PDC numbers and function are affected in HIV infection, and are either impaired by HIV replication or may be important in the control of HIV replication. In HCV-infected subjects, cultured APC populations have been shown to have impaired function in allostimulatory mixed lymphocyte reactions (30, 31, 32). In one study, this reduced allostimulatory capacity was associated with reduced IFN-γ secretion in mixed lymphocyte reaction supernatants and reduced LPS-induced IL-12-secreting capacity (32). Consistent with this impairment in allostimulatory function are the findings that HCV-infected individuals have an impaired response to new antigenic stimulation with hepatitis A, hepatitis B, and influenza vaccinations (33, 34, 35), while responses to recall Ags are unimpaired (10, 13, 14, 36). Therefore, it appears that there is an APC-based impairment in development of T cell responses in HCV infection. To investigate the mechanism underlying our previous finding that HIV infection impacts on HCV-specific T cell responses in individuals coinfected with both viruses, we explored the effect of HIV infection on APC dysfunction present in HCV infection. We conducted an analysis of circulating DC precursor frequency and function in HCV, HCV-HIV, and HIV-infected subjects. HIV-infected subjects with slow progressor phenotype were analyzed separately. Our data reveal a predominant deficit of non-PDC-associated IFN-α-secreting function in HIV-infected subjects, whereas we observed a predominant deficit of PDC-associated IFN-α-secreting function in HCV-infected subjects. Both functions are dramatically impaired in HCV-HIV-infected subjects. Furthermore, we observed defects in MDC-associated IL-12-producing function in both HIV and HCV-infected subjects. Moreover, HCV-HIV coinfected subjects were observed to have reduced HCV-specific IFN-γ-producing T cell responses in comparison to HCV singly infected subjects. Finally, there appears to be a relation between immature DC function and the presence of HCV-specific type 1 cytokine-producing T cell immunity. These data indicate that impairment of immature DC function differs between HCV and HIV infection, and offer one mechanism by which HIV infection may impact on the adaptive immune response to HCV. Chronic HCV-infected subjects (n = 18) had detectable serum HCV Ab and RNA. HCV-HIV coinfected subjects (HCV-HIV progressors, n = 13; HCV-HIV slow progressors, n = 7) had, in addition, detectable HIV Abs. HIV singly infected subjects (HIV progressors, n = 15; HIV slow progressors, n = 4) had HIV Ab, but no detectable HCV Ab. Slow progressor subjects were HIV infected for at least 7 years, without clinical manifestations of HIV infection, without previous HIV therapy, and had CD4 cell counts >400/μl. No subject had previously received therapy for HCV. Eleven healthy controls had no HCV or HIV Abs. All studies were performed with approval of the institutional review boards for human studies at the Cleveland Veterans Affairs Medical Center and University Hospitals of Cleveland (Cleveland, OH). Recombinant HCV core, NS3, NS4, and NS5 proteins were supplied by Chiron (Emeryville, CA). HCV core 15-mer peptides with 11-aa overlap (n = 45) were synthesized by the multipin technique (Chiron Technologies, Raleigh NC), and pooled together as a set. A set of 73 MHC class I-restricted HCV peptides representing portions of the HCV genotype 1 protein sequence, based upon previously described CD8 determinants (8, 37, 38, 39), were synthesized by the multipin technique (Chiron Technologies) and pooled together as a set. Where published sequences differed from those published by Choo et al. (40), additional peptides were designed to match the latter sequence. Sixty one of these 73 peptides have been previously described as a set (41). The remaining 12 peptides in the set of 73 were also based upon previously described CD8 determinants (10, 42, 43, 44) as follows: core 111-119 DPRRRSRNL, NS5 2594-2602 ALYDVVTKL, E2 530-539 GENDTDVFVL, E2 654-662 LEDRDRSEL, NS4 1941-1948 AARVTAIL, NS5 2152-2160 HEYPVGSQL, NS5 2161-2171 PCEPEPDVAVL, NS5 2221-2231 SPDAELIEANL, NS3 1359-1367 HPNIEEVAL, NS4B 1666-1675 VLAALAAYCL, NS5A 1987-1995 VLSDFKTWL, and NS5A 2140-2149 LLREEVSFRV. Four-color FACS analysis was performed on freshly Ficoll-prepared PBMC populations (1 × 106 PBMC analyzed per sample). PBMC that lack lineage marker expression (CD3, CD14, CD16, CD19, CD20, and CD56) (Dendritic Cell Bundle kit; BD Biosciences, Mountain View, CA), express HLA DR, and express CD11c were identified as MDC; while PBMC that lack lineage marker expression, express HLA DR, and express CD123 were identified as PDC (15, 21, 22). Frequencies of these populations were determined as the proportion of live PBMC that stained negative or positive for the appropriate markers (Fig. 1⇓). Four-color analysis was performed on a FACSCalibur (BD Biosciences) flow cytometer using CellQuest Software (BD Biosciences). Notably, there are likely multiple myeloid-derived APC subsets (45, 46), and a small subset of CD16-expressing MDC that may not be as efficient as other MDC subsets in accessory function has previously been described (46, 47). Based upon our lineage marker gating, we have excluded this latter subset expressing CD16 in our analysis of immature MDC. FACS analysis of PBMC for MDC and PDC frequency. Frequencies of MDC and PDC populations were determined as the proportion of live PBMC (initial gate based upon forward and side scatter) that lack lineage marker expression (CD3, CD14, CD16, CD19, CD20, and CD56) shown in second gate, express HLA DR, and express CD11c (MDC) or CD123 (PDC). In some experiments, MDC and PDC subset analysis was combined with intracellular cytokine staining for IL-12 or IFN-α using mouse anti-human IL-12 (p40/p70) mAb PE (clone: C11.5; BD PharMingen, Mountain View, CA) or mouse monoclonal anti-human α2-IFN PE (clone: 225.2C; Chromaprobe, Aptos, CA). Freshly prepared PBMC populations (600,000 cells/well) were stimulated in 96-well plates with medium alone, 50 μg/ml poly(I:C) (Amersham Biosciences, Piscataway, NJ), 25 μM CpG (ACCGATAACGTTGCCGGTGACGGCACCACG), or 25 μM CpG control (ACCGATACCGGTGCCGGTGACGGCACCACG) (48) for 20 h at 37°C in the presence of penicillin, streptomycin, l-glutamine, and 5% human AB serum (Gemini Bio-Products, Woodland, CA). Culture supernatants were quantitated for IFN-α by standard ELISA which measured human IFN-αA, α2, αA/D, αD, αK, and α4b (BioSource International, Camarillo, CA). Poly(I:C) and CpG concentration curves revealed that the above concentrations were within the upper linear range for stimulation of IFN-α production (not shown). Time curves performed revealed that a 20-h incubation was optimal for quantitating IFN-α production. IL-12 (p40/p70) was also quantitated from culture supernatants using standard ELISA (R&D Systems, Minneapolis MN). No detectable LPS contaminant was observed in poly(I:C) preparations using E-TOXATE assay (Sigma-Aldrich, St. Louis, MO). Depletions of CD11c or CD123-bearing cell populations were performed using RosetteSep depletion mixtures (StemCell Technologies, Vancouver, British Columbia, Canada) resulting in depletion of over 75% of MDC and 60% of PDC populations, respectively. PBMC were plated (3 × 105 cells/well), in the presence (in duplicate) or absence (in triplicate) of pooled peptide (HCV core 15-mer pool at 2 μM each peptide and 0.5% DMSO or pool of 73 previously defined CD8 determinants, at 3.4 μM for each peptide and 0.5% DMSO) or protein Ag (10 μg/ml). Ninety-six-well ELISPOT cell cultures were incubated for 20 h at 37°C, developed, and analyzed as previously described (41, 49, 50, 51). A response was defined here as a peptide-specific IFN-γ-producing frequency ≥20/million PBMC, and 3 SDs greater than the mean frequency in the absence of peptide. Continuous data are displayed as medians. Differences among groups were compared using ANOVA when samples were normally distributed, or using Kruskal Wallis when samples were not normally distributed. When differences existed, Tukey’s test was used to compare values between groups when normally distributed, and the Mann-Whitney U test was used when samples were not normally distributed. The nonparametric Spearman’s test was used to explore correlations. χ2 analysis was used to compare the proportion of subjects in each group with an HCV-specific T cell response. All analyses were done using SPSS version 11.0 (Chicago, IL). Study subject characteristics are shown in Table I⇓. The HCV plasma level was lower in HCV-HIV slow progressors as compared with HCV-HIV progressors (480,000 vs 1,680,000 IU/ml; p = 0.04), extending upon our previously published finding where a nonsignificant trend existed (14). Plasma HIV levels and CD4 cell counts did not significantly differ between HCV-HIV progressors, HCV-HIV slow progressors, HIV slow progressors, and HIV-infected progressor subjects, though there was a trend toward higher CD4 cell counts in HCV-HIV slow progressors and HIV slow progressors vs HIV and HCV-HIV-infected subjects (median 719 and 727 vs 503 and 532 cells/μl, p > 0.05). Ten of 13 HCV-HIV progressors and 11 of 15 HIV-infected subjects were receiving antiretroviral therapy. 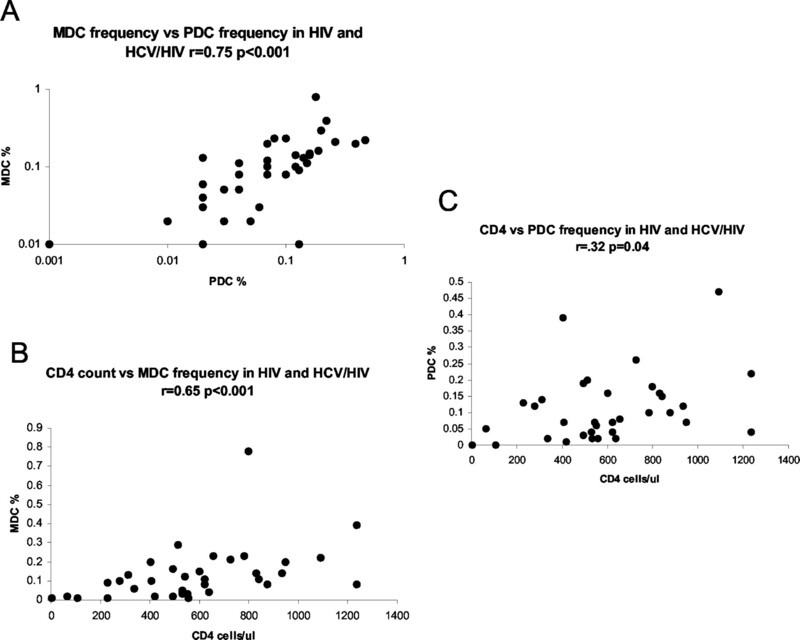 To assess MDC and PDC frequencies as a function of HCV vs HIV infection, we performed a cross-sectional analysis of PBMC populations freshly prepared from our groups of HCV-infected, HCV-HIV coinfected with progressive HIV disease, HCV-HIV-infected with slow progressor status, HIV slow progressors, HIV-infected progressors, and healthy control subjects. Because cell surface phenotype did not vary between HCV-HIV slow progressors and HIV slow progressors, these two groups are represented as the same group (HIV slow progressors). As shown in Fig. 2⇓, MDC frequencies tended to be reduced in HIV and HCV-HIV-infected subjects with progressive HIV disease as compared with HCV-infected subjects (median 0.11 ± 0.08%, 25/75th percentile 0.03/0.15% and 0.08 ± 0.05% 25/75th percentile 0.03/0.13% vs 0.2 ± 0.18%, 25/75th percentile 0.11/0.29%, p = 0.05 and p = 0.01; Fig. 2⇓A). In contrast, PDC frequency was minimally reduced in HCV and HCV-HIV-infected progressors as compared with healthy control subjects (median 0.08 ± 0.05%, 25/75th percentile 0.06/0.14% and 0.07 ± 0.05%, 25/75th percentile 0.03/0.13% vs 0.11 ± 0.13%, 25/75th percentile 0.09/0.36%, p = 0.04 and p = 0.04; Fig. 2⇓B). Overall, these data indicate that in HIV infection there tend to be modest (1.8-fold) reductions in frequencies of MDC populations, while in HCV infection there are minimal (1.4-fold) reductions in frequencies of PDC populations. Frequencies of MDC and PDC in HCV, HCV-HIV, HIV slow progressor, HIV, and healthy control subject PBMC populations. Four-color FACS analysis was performed on freshly Ficoll-prepared PBMC populations obtained from HCV-infected (n = 16), HCV-HIV-infected (n = 13), HIV-infected with slow progressor status (n = 10; HCV-HIV slow progressors n = 3, and HIV slow progressors n = 4; combined together and referred to as HIV sp), HIV-infected (n = 12), and healthy control (n = 10) subjects. A, Frequencies of PBMC that lack lineage marker expression (CD3, CD14, CD16, CD19, CD20, and CD56), express HLA DR, and express CD11c (MDC). 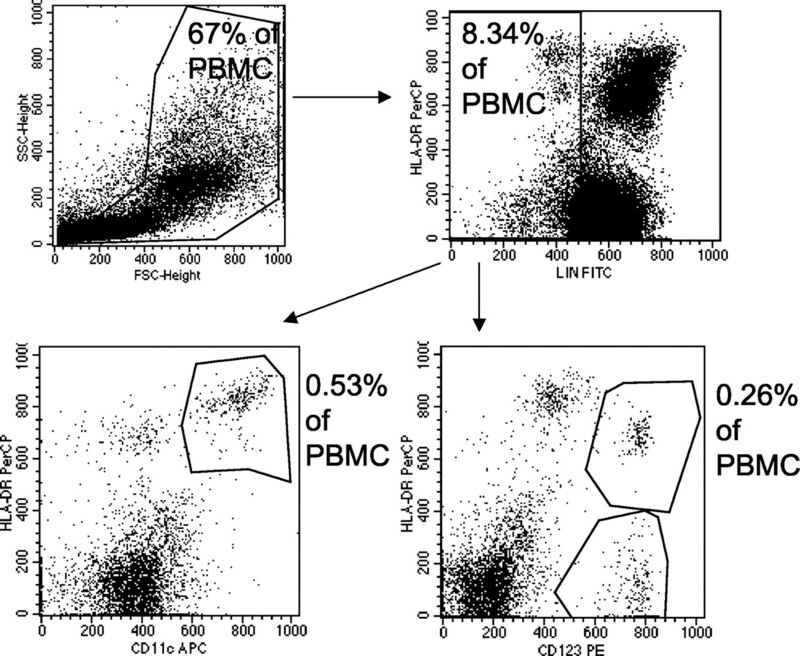 B, The frequencies of PBMC that lack lineage marker expression, express HLA DR, and express CD123 (PDC). Median values for each group are marked. Because CD4 cell count often reflects the stage of HIV-related disease, and to investigate whether MDC and PDC frequency are correlated, we compared MDC and PDC frequencies, and CD4 cell numbers, in our subjects. We observed direct correlations between MDC and PDC frequencies in all groups separately and combined. Fig. 3⇓A and Table II⇓ show this relation for HIV and HCV-HIV coinfected groups combined (r = 0.75, p = <0.001). Additionally, CD4 cell count directly correlated with MDC frequency in HIV-infected groups combined (r = 0.65, p < 0.001, Fig. 3⇓B). There was also a weak direct correlation between CD4 cell count and PDC frequency in HIV and HCV-HIV coinfected subjects when combined (r = 0.32, p = 0.04, Fig. 3⇓C). Therefore, MDC and PDC frequencies are closely related to each other in both the presence and absence of viral infection with HCV or HIV, and each population is associated with CD4 cell number in HIV-infected subjects. Correlations between MDC frequency, PDC frequency, and CD4 count. Correlation plots are shown for HIV and HCV-HIV coinfected subjects combined (n = 36). A, MDC vs PDC frequencies; B, CD4 cell count vs MDC frequency; C, CD4 cell count vs PDC frequency. We next investigated MDC and PDC function in freshly prepared nonexpanded PBMC subpopulations by stimulation with the Toll-like receptor (TLR) ligands poly(I:C) and CpG oligodeoxynucleotides. Both poly(I:C) and CpG have been previously described to stimulate DC populations via TLR3 and TLR9, respectively (15, 52, 53). Poly(I:C) stimulates IFN-α secretion from non-PDC or MDC populations (48) (23, 53), while CpG stimulates IFN-α secretion from PDC populations (52, 54). To minimize in vitro artifact that purification or long-term cell culture can introduce, we used these two reagents to directly stimulate freshly prepared PBMC populations. Stimulation with control oligonucleotides lacking the CpG motif resulted in no IFN-α production (not shown). As shown in Fig. 4⇓, poly(I:C) induced IFN-α secretion, and this activity was inhibited by selective depletion of cells bearing the MDC marker CD11c. CpG also induced IFN-α secretion, and this activity was inhibited by selective depletion of cells bearing the PDC marker CD123. Intracellular staining for IL-12 followed by FACS analysis confirmed that MDC cells (Lin−/HLA DR+/CD11C+) produced IL-12 in response to poly(I:C) (not shown). Therefore, stimulation of freshly prepared PBMC populations with these two reagents allows for assessment of non-PDC-associated IFN-α, MDC-associated IL-12, and PDC-associated IFN-α-producing capacity. Poly(I:C) and CpG-induced IFN-α is dependent on CD11c and CD123-expressing cell compartments, respectively. Depletion of CD11c or CD123-bearing cell populations was performed with three separate healthy control subjects, resulting in selective depletion of 75–90% of MDC and 60–90% of PDC populations, respectively. Additionally, evaluation of the lin−DR+CD11c− and CD123− populations revealed that CD11c depletion resulted in at least 75% reduction in the lin−DR+CD123− population, while CD123 depletion resulted in at least 39% reduction in the lin−DR+CD11c− population, indicating that depletion reagent did not just remove the surface molecule, but the cell population expressing the appropriate surface molecule (not shown). 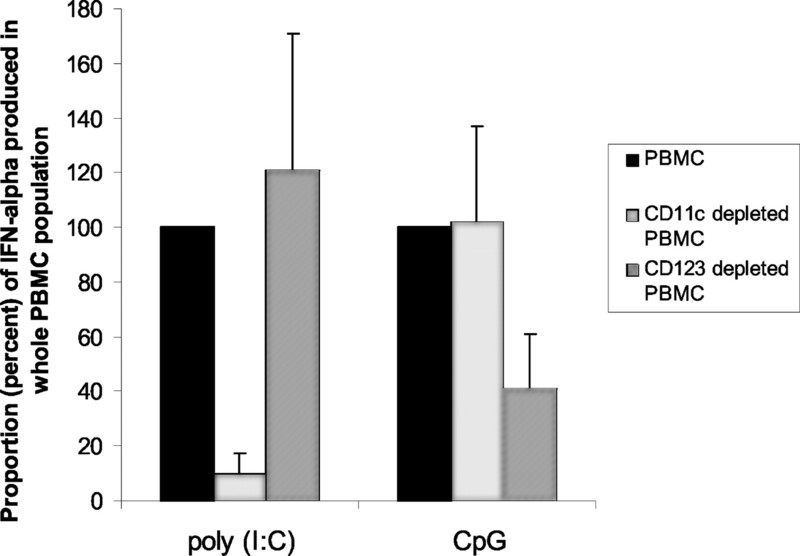 These same freshly prepared PBMC, CD11c-depleted PBMC, or CD123-depleted PBMC populations (600,000 cells) from these three healthy control subjects were stimulated with medium alone, poly(I:C) (50 μg/ml), or CpG (25 μM) 20 h at 37°C. Culture supernatants were quantitated for IFN-α by standard ELISA. Poly(I:C)-induced IFN-α ranged from 400 to 452 pg/ml and CpG-induced IFN-α ranged from 480 to 1500 pg/ml in nondepleted PBMC populations, while <10 pg/ml was observed in medium-containing wells (not shown). The proportion (percent) of nondepleted PBMC poly(I:C) or CpG-induced IFN-α-induced activity is shown for CD11c and CD123-depleted populations. Depletion of CD11c-bearing cells reduced poly(I:C)-induced IFN-α production by 90% (activity reduction corresponding closely with MDC depletion efficiency), while depletion of CD123-bearing cells reduced CpG-induced IFN-α production by 60% (again activity reduction corresponding closely with PDC depletion efficiency). This experiment was performed two additional times with one of the three healthy control subjects. Because IFN-α plays a role in priming type 1 T cells, we next examined poly(I:C)-induced IFN-α (non-PDC associated) and CpG-induced IFN-α (PDC associated)-producing capacity in freshly prepared PBMC from our subjects. As shown in Fig. 5⇓A, poly(I:C)-induced IFN-α-producing capacity was reduced 17-fold in HIV and HCV-HIV subjects as compared with HCV-infected subjects (median 30 ± 323 pg/ml, 25/75th percentile 11.5/130 pg/ml and 40 ± 73 pg/ml, 25/75th percentile 14/120 pg/ml vs 510 ± 314 pg/ml, 25/75th percentile 290/762 pg/ml, p = 0.005 and p < 0.001), and reduced 12-fold in HCV-HIV-infected subjects when compared with healthy control subjects (median 40 ± 73 pg/ml, 25/75th percentile 14/120 pg/ml vs 380 ± 212 pg/ml, 25/75th percentile 195/627 pg/ml p = 0.03). Poly(I:C)-induced IFN-α production did not significantly differ between HCV-infected subjects and healthy control or HIV slow progressor (with or without HCV coinfection) subjects (510 ± 314 pg/ml, 25/75th percentile 290/762 pg/ml vs 380 ± 212 pg/ml, 25/75th percentile 195/627 pg/ml and 110 ± 238 pg/ml, 25/75th percentile 33/412 pg/ml, p > 0.05). In contrast, CpG-induced IFN-α-producing capacity was reduced 20- and 40-fold in HCV and HCV-HIV-infected subjects as compared with healthy control subjects (40 ± 239 pg/ml, 25/75th percentile 10/235 pg/ml and 20 ± 134 pg/ml, 25/75th percentile 10/100 pg/ml vs 800 ± 531 pg/ml, 25/75th percentile 35/1155 pg/ml, p = 0.02 and p = 0.008), while there was only a 6-fold nonsignificant reduction in activity in HIV slow progressors (with or without HCV coinfection) and HIV-infected progressor subjects as compared with healthy controls (135 ± 302 pg/ml, 25/75th percentile 33/412 pg/ml and 130 ± 563 pg/ml, 25/75th percentile 12/585 pg/ml vs 800 ± 531 pg/ml, 25/75th percentile 35/1155 pg/ml, p > 0.05 Fig. 5⇓B). In contrast to the 1.8- and 1.4-fold reductions in MDC and PDC frequencies observed in Fig. 2⇑, over 10-fold differences in functional activity are observed in most cases here. These results indicate that non-PDC and PDC populations are selectively and differently functionally impaired in HCV and HIV infections. Poly(I:C)-induced IFN-α-producing activity (non-PDC-associated activity) is reduced in HIV infection, while CpG-induced IFN-α-producing activity (PDC-associated activity) is reduced in HCV infection. Freshly prepared PBMC populations obtained from subjects described in Fig. 2⇑ were stimulated with poly(I:C) (A) or CpG (B) as described in Fig. 4⇑, and IFN-α was quantitated from culture supernatants. C, IL-12 was quantitated from a subset of poly(I:C)-stimulated PBMC culture supernatants (10 HCV, 7 HCV-HIV, 8 HIV SP (6 with HCV coinfection), 13 HIV, and 8 healthy control subject samples analyzed for this graph). Because IL-12 is also known to be important in priming type 1 T cells, we measured MDC-associated IL-12 production in response to poly(I:C). CpG failed to induce IL-12 in PBMC cultures in all subjects (not shown). In contrast, poly(I:C)-induced IL-12 was readily observed in healthy control subjects, while this capacity was dramatically (over 10-fold) reduced in HCV, HIV, and HCV-HIV-infected subjects as compared with healthy controls (8 ±27 pg/ml, 25/75th percentile 4.7/26.3 pg/ml, 6 ± 8.3 pg/ml, 25/75th percentile 3.5/9 pg/ml, and 5 ± 4 pg/ml, 25/75th percentile 2/6 pg/ml vs 83 ± 38 pg/ml, 25/75th percentile 25/90 pg/ml, p = 0.004, p < 0.001, p < 0.001, respectively; Fig. 5⇑C). IL-12 production was not significantly impaired in HIV slow progressors when compared with healthy controls (32 ± 35 pg/ml, 25/75th percentile 4/69 pg/ml vs 83 ± 38 pg/ml, 25/75th percentile 25/90 pg/ml p > 0.05). Therefore, poly(I:C)-induced MDC-associated IL-12 production is dramatically reduced in both HIV and HCV infections. When we analyzed the relationships among non-PDC, MDC, and PDC activities, cell frequencies, and viral levels, a number of correlations were observed. Table II⇑ summarizes all nominally significant (p < 0.05) correlations. A positive correlation was observed between poly(I:C)-induced non-PDC IFN-α and MDC IL-12 production in all HCV-infected groups combined and all HIV-infected groups combined (r = 0.46 and r = 0.57, p = 0.03 and p = 0.001), while an inverse correlation between non-PDC IFN-α and MDC IL-12 production was observed in healthy control and HCV singly infected subjects (r = −0.68 and r = −0.75, p = 0.04 and p = 0.04), suggesting different relationships between these functions in the presence vs the absence of different chronic viral infections. 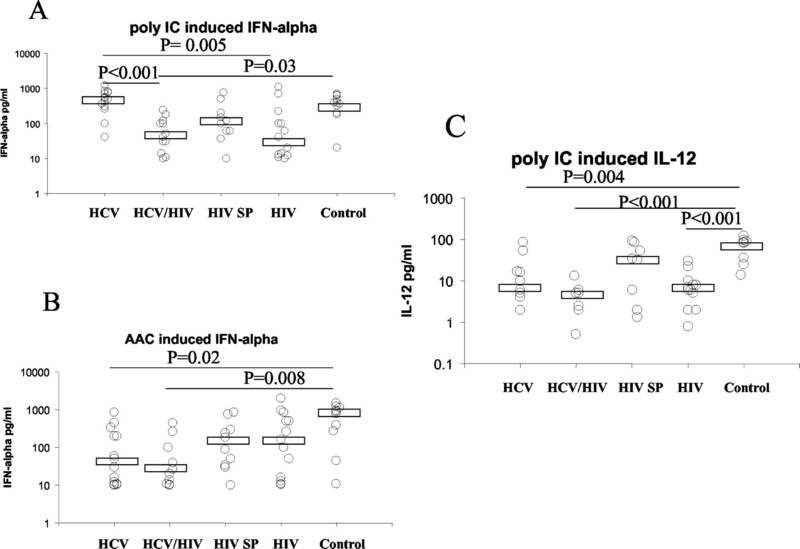 Notably, inverse correlations were observed between HIV and HCV plasma levels and poly(I:C)-induced IFN-α-producing capacity in both HCV and HIV-infected subjects (r = −0.41 and r = −0.25, p = 0.03 and p = 0.02), while in HIV-infected subjects there was also an inverse relationship between poly(I:C)-induced IL-12 production and HIV levels (r = −0.53, p = 0.004). Finally, while there appears to be concordant regulation of non-PDC and PDC IFN-α-producing functions in healthy control subjects (r = 0.79, p = 0.002), this regulation appears to be affected in HCV and HIV infections (p > 0.05). Therefore, immature DC activity may play a role in control of viral level. Alternatively, viral level may determine immature DC activity. Again, there appear to be distinctly different relationships between virus and immature DC activity comparing chronic HCV and HIV infections. HCV-specific IFN-γ-producing T cell responses were not observed in healthy control subjects (not shown). Consistent with our previous observation that HCV recombinant protein-specific proliferative responses are reduced in HCV-HIV subjects as compared with HCV-infected subjects (13), we found here that the proportion of subjects with an HCV Ag-specific IFN-γ-producing T cell response was reduced in HCV-HIV-infected groups as compared with HCV singly infected groups using a more complete set of HCV Ags (HCV core, NS3, NS4, and NS5 protein Ags; HCV core overlapping 15-mer peptides; and previously defined HCV CD8 determinants) (80 vs 11%, p = 0.04; Fig. 6⇓). Additionally, the number of protein Ags, or protein Ags and peptide Ags combined, that were recognized was reduced in HCV-HIV-infected subjects as compared with HCV singly infected subjects (p = 0.03 and p = 0.005, not shown). We did not distinguish between the CD4 and CD8 compartment for response here. Moreover, a positive correlation was observed between poly(I:C)-induced PBMC IL-12 production and HCV-specific T cell frequency in HCV singly infected subjects (r = 0.9, p = 0.02; Table II⇑). Therefore, in those subjects where the most dramatic reductions in MDC and PDC function are observed (HCV-HIV-infected subjects), fewer HCV-specific T cell responses were observed, while HCV-specific IFN-γ-producing T cell frequency appears to be directly related to MDC function. HCV-HIV-infected subjects have fewer HCV-specific IFN-γ-producing T cells than do HCV singly infected subjects. IFN-γ ELISPOT assays were performed with PBMC from HCV, HCV-HIV, and healthy control subjects evaluated in Fig. 5⇑, using both peptide and protein antigenic stimuli as described in Materials and Methods. Proportion (percent) of subjects in HCV and HCV-HIV-infected groups that had HCV-specific IFN-γ-producing T cell responses are shown. Impairment in APC function has been proposed to play a role in the persistence of HCV infection (30, 31, 32) and in the immune deficiencies of HIV infection (25, 26, 27). We describe here deficiencies in function out of proportion to deficiencies in frequency of immature DC populations circulating in the periphery of HCV and HIV-infected subjects. These deficiencies distinctly differ between HCV and HIV infection, and dually infected subjects have the most severe and combined deficiency of these functions. Specifically, non-PDC IFN-α-producing capacity was dramatically reduced in HIV-infected subject groups, with MDC frequencies only tending to be reduced. In contrast, PDC IFN-α-producing capacity was markedly reduced in HCV-infected subject groups, while PDC frequencies were only minimally reduced. PDC IFN-α production also tended to be reduced in the HIV singly infected subjects, though this did not reach statistical significance. Furthermore, MDC IL-12 production was markedly reduced in both HCV and HIV-infected subjects. HCV-HIV coinfected subjects displayed the most dramatic impairment in all functions. The observed inverse relationship between HIV and HCV viral levels and non-PDC IFN-α-producing capacity, and between MDC IL-12-producing activity and HIV levels suggests that these functional properties may play an important role in mounting or maintaining a successful immune response against chronic HCV and HIV infections. Finally, HIV-infected subjects with slow progressor phenotype did not differ from healthy controls with regard to MDC and PDC frequency or function, suggesting that dysfunction induced by both HCV and HIV infections was attenuated in these subjects. These results indicate that immature DC functions in HIV and HCV disease are dysregulated, but differentially, and implicate a mechanism by which APC function may contribute to the immune deficiencies of these two chronic viral infections. To investigate the effect that these dysfunctional immature DC populations may have on the adaptive arm of the immune response in chronic HCV and HIV infection, we investigated HCV-specific T cell responses in these same subjects. We found a relation between MDC IL-12-producing activity and HCV-specific IFN-γ-producing T cell frequency in HCV singly infected subjects, indicating that this activity may be important for formation or maintenance of HCV-specific T cell responses. Moreover, HCV-specific IFN-γ-producing T cell frequency was reduced in HCV-HIV coinfected subjects with progressive HIV disease as compared with HCV singly infected subjects. These latter data extend upon our previous finding comparing CD4 proliferative responses in HCV vs HCV-HIV-infected individuals (14), including here a larger number of HCV Ags, though not distinguishing between the CD4 and CD8 compartment. Although the decreased frequency of HCV-specific IFN-γ-producing cells present in HCV-HIV-infected individuals may be related to reduced CD4 cell numbers or function that occur in HIV infection, this reduced activity may also be due in part to the decreased immature DC functional activities observed in the HCV-HIV coinfected subjects as compared with HCV or HIV singly infected subjects. Therefore, it appears that MDC and PDC dysfunction in HCV and HIV infections could directly impact upon HCV-specific T cells immunity. Previous investigations have found reduced MDC and PDC numbers in HIV infection (25, 26, 27). Our data are in agreement with these previous reports (Table III⇓). PDC frequencies were found here to be similar in HCV and HIV-infected subjects, and lower than those in healthy control subjects. Likely because of high subject-to-subject variability in cell frequency, however, only the difference between HCV and healthy control subjects was observed to be significant. Additionally, reduced MDC and PDC cell frequencies were found here to be more pronounced in HCV-HIV coinfected subjects. Moreover, MDC and PDC frequencies in HIV or HCV-HIV-infected subjects with slow progressor status did not significantly differ from those in healthy control subjects, suggesting that slow progressor HIV phenotype is associated with a preservation of these cells. We further found a direct relation between MDC and PDC frequency in all groups (including healthy control subjects), suggesting that both populations are regulated in similar fashion. Our observation that CD4 cell count is related to immature DC frequency in HIV-infected subjects may reflect disease stage, or may reflect a particular dependent relationship between CD4 cell and immature DC cell homeostasis. Perhaps most importantly, the overall frequencies of MDC and PDC do not differ by >2-fold in any of the disease states we have examined. This modest quantitative difference contrasts dramatically with the more dramatic differences in immature DC activity that we observed. HSV and influenza-induced PDC IFN-α-secreting capacity has previously been found to be reduced in peripheral blood-derived populations of HIV-infected subjects (25, 26, 27). Additionally, IFN-α-producing capacity has been previously found to correlate inversely with HIV plasma levels, consistent with an importance of this function in the control of HIV (25, 27). Our data in HIV-infected subjects are in agreement with these previous findings in that HIV-infected subjects tended to have reduced PDC-associated function. Our data extend upon these previous findings by revealing reduced non-PDC-associated function in HIV-infected subjects. We additionally find here a more pronounced reduction in PDC-associated IFN-α-producing activity in HCV-infected subjects. Previous reports have described a reduction in IL-12-secreting capacity in both HIV and HCV-infected subjects (28, 29, 32, 55). Our data are in agreement with these previous reports, and also indicate a relationship between IL-12-producing function and virus-specific T cell immunity in the case of HCV, and viral replication in the case of HIV. Together, these data support the notion that immature DC IFN-α and IL-12-producing functions play important roles in host defenses against HCV and HIV. Because we have performed these functional assays with freshly prepared and minimally manipulated cell fractions (PBMC), these immature DC activities are less likely to be affected by in vitro artifact that may exist in more commonly studied systems where immature DC cell fractions are cultured for a period of days in the presence of cytokine before activity assay. Also, in comparison to activity studies performed with purified or enriched MDC or PDC populations, the activities measured here are more likely to reflect the complex interactions that occur in vivo. For example, in a recently published study by Lore et al. (54), purified uncultured MDC populations were unable to produce IFN-α in response to poly(I:C), while in the study by Kadowaki et al. (48) cultured MDC were capable of IFN-α secretion in response to poly(I:C). Our data with unpurified cell populations in short-term culture (<24 h) indicate poly(I:C)-induced IFN-α production is dependent on non-PDC, CD11c-bearing cell populations. CD11c-bearing cell populations other than MDC include monocytes, NK cells, and granulocytes. As an independent means of localizing activity to the cell compartment, preliminary data using intracellular staining and FACS analysis confirmed that PDC cells (Lin−/HLA DR+/CD123+) produced IFN-α in response to CpG, and not in response to CpG control or to poly(I:C) (not shown). Therefore, our data with poly(I:C)-induced IFN-α activity are consistent with previous literature (23, 48) in that it is dependent on non-PDC populations. If this activity is MDC derived, it may also require the presence of cell types other than MDC. The mechanism by which immature DC cells become dysfunctional in HCV and HIV infections is currently unclear. The presence of HCV RNA within APC has been proposed as a possible cause of impaired allostimulatory function of these cells (31). In support of this is the observation that when DC from normal donors are transduced with the HCV gene containing adenovirus constructs, the ability to stimulate CD4 cells is impaired, resulting in incomplete activation (56). Similarly, direct infection of DC by HIV may cause a similar impairment (57). Such findings have led to the hypothesis that APC containing HCV are selectively impaired in T cell priming activity, while “uninfected” APC are capable of priming normal CD4 responses. Other potential causes of impaired peripheral immature DC function include a reduced formation of functional immature DC populations, an increased rate of destruction of these populations, trafficking of these populations from the periphery to the site of organ damage, or TLR desensitization in HCV and HIV infections. Evidence for the latter possibility has been shown in other systems, with operative mechanisms involving heterologous Toll receptor desensitization, enhanced expression of inhibitors of Toll-mediated signaling, and specific pathogen-encoded products that inhibit Toll-mediated signaling (58, 59, 60). Clearly, an improved understanding of immature DC function in the HCV and HIV-infected host should allow for important insight into both innate and adaptive immunity in humans with chronic viral infection. In conclusion, these data implicate distinctly different immature DC functional impairments in HCV and HIV infections, and a dual and more pronounced impairment in immature DC function in HCV-HIV coinfected individuals. Interestingly, the HIV slow progressor phenotype appears to ameliorate both HCV and HIV dysfunctional immature DC phenotypes, indicating that these individuals preserve a number of cellular immune functions not only during HIV infection, but also during HCV infection. Because an association between immature DC function and adaptive immunity was observed, these immature DC dysfunctional phenotypes may play an important role in defining the reduced HCV-specific adaptive T cell response observed in HCV-HIV-infected individuals as compared with HCV singly infected individuals. We thank Dr. Michael Houghton (Chiron) for recombinant hepatitis C proteins. ↵1 This work was supported by a Veterans Affairs Career Development Award and National Institutes of Health Grants RO1AI47839, PO1AI055793, UO1AI38858, and P30AI36219 (a Case Western Reserve University Center for AIDS Research Core Facility Development Award). ↵3 Current address: Boehringer Ingelheim Pharmaceuticals, Ridgebury, CT.
↵4 Abbreviations used in this paper: HCV, hepatitis C virus; DC, dendritic cell; MDC, myeloid-derived DC; PDC, plasmacytoid-derived DC; TLR, Toll-like receptor. Freeman, A. J., G. J. Dore, M. G. Law, M. Thorpe, J. Von Overbeck, A. R. Lloyd, G. Marinos, J. M. Kaldor. 2001. Estimating progression to cirrhosis in chronic hepatitis C virus infection. Hepatology 34:809. Lauer, G. M., B. D. Walker. 2001. Hepatitis C virus infection. N. Engl. J. Med. 345:41. Benhamou, Y., M. Bochet, V. Di Martino, F. Charlotte, F. Azria, A. Coutellier, M. Vidaud, F. Bricaire, P. Opolon, C. Katlama, T. Poynard. 1999. Liver fibrosis progression in human immunodeficiency virus and hepatitis C virus coinfected patients: the Multivirc group. Hepatology 30:1054. Benhamou, Y., V. Di Martino, M. Bochet, G. Colombet, V. Thibault, A. Liou, C. Katlama, T. Poynard. 2001. Factors affecting liver fibrosis in human immunodeficiency virus-and hepatitis C virus-coinfected patients: impact of protease inhibitor therapy. Hepatology 34:283. Graham, C. S., L. R. Baden, E. Yu, J. M. Mrus, J. Carnie, T. Heeren, M. J. Koziel. 2001. Influence of human immunodeficiency virus infection on the course of hepatitis C virus infection: a meta-analysis. Clin. Infect. Dis. 33:562. Cacoub, P., L. Geffray, E. Rosenthal, C. Perronne, P. Veyssier, G. Raguin. 2001. Mortality among human immunodeficiency virus-infected patients with cirrhosis or hepatocellular carcinoma due to hepatitis C virus in French Departments of Internal Medicine/Infectious Diseases, in 1995 and 1997. Clin. Infect. Dis. 32:1207. Monga, H. K., M. C. Rodriguez-Barradas, K. Breaux, K. Khattak, C. L. Troisi, M. Velez, B. Yoffe. 2001. Hepatitis C virus infection-related morbidity and mortality among patients with human immunodeficiency virus infection. Clin. Infect. Dis. 33:240. Koziel, M. J.. 1997. The role of immune responses in the pathogenesis of hepatitis C virus infection. J. Viral Hep. 4:31. Nelson, D. R., C. G. Marousis, G. L. Davis, C. M. Rice, J. Wong, M. Houghton, J. Y. N. Lau. 1997. The role of hepatitis C virus-specific cytotoxic T lymphocytes in chronic hepatitis C. J. Immunol. 158:1473. Gruener, N. H., F. Lechner, M. C. Jung, H. Diepolder, T. Gerlach, G. Lauer, B. Walker, J. Sullivan, R. Phillips, G. R. Pape, P. Klenerman. 2001. Sustained dysfunction of antiviral CD8+ T lymphocytes after infection with hepatitis C virus. J. Virol. 75:5550. Lechner, F., D. K. H. Wong, P. R. Dunbar, R. Chapman, R. T. Chung, P. Dohrenwend, G. Robbins, R. Phillips, P. Klenerman, B. D. Walker. 2000. Analysis of successful immune responses in persons infected with hepatitis C virus. J. Exp. Med. 191:1499. Lauer, G. M., T. N. Nguyen, C. L. Day, G. K. Robbins, T. Flynn, K. McGowan, E. S. Rosenberg, M. Lucas, P. Klenerman, R. T. Chung, B. D. Walker. 2002. Human immunodeficiency virus type 1-hepatitis C virus coinfection: intraindividual comparison of cellular immune responses against two persistent viruses. J. Virol. 76:2817. Valdez, H., D. Anthony, F. Farukhi, A. Patki, J. Salkowitz, P. Heeger, D. L. Peterson, A. B. Post, R. Asaad, M. M. Lederman. 2000. Immune responses to hepatitis C and non-hepatitis C antigens in hepatitis C virus infected and HIV-1 coinfected patients. AIDS 14:2239. Valdez, H., N. L. Carlson, A. B. Post, R. Asaad, P. S. Heeger, M. M. Lederman, P. V. Lehmann, D. D. Anthony. 2002. HIV long-term non-progressors maintain brisk CD8 T cell responses to other viral antigens. AIDS 16:1113. Sallusto, F., A. Lanzavecchia. 1994. Efficient presentation of soluble antigen by cultured human dendritic cells is maintained by granulocyte/macrophage colony-stimulating factor plus interleukin 4 and downregulated by tumor necrosis factor α. J. Exp. Med. 179:1109. Trinchieri, G.. 1995. Interleukin-12: a proinflammatory cytokine with immunoregulatory functions that bridge innate resistance and antigen-specific adaptive immunity. Annu. Rev. Immunol. 13:251. Cousens, L. P., R. Peterson, S. Hsu, A. Dorner, J. D. Altman, R. Ahmed, C. A. Biron. 1999. Two roads diverged: interferon α/β- and interleukin 12-mediated pathways in promoting T cell interferon γ responses during viral infection. J. Exp. Med. 189:1315. Langenkamp, A., M. Messi, A. Lanzavecchia, F. Sallusto. 2000. Kinetics of dendritic cell activation: impact on priming of TH1, TH2 and nonpolarized T cells. Nat. Immunol. 1:311. Feldman, S., D. Stein, S. Amrute, T. Denny, Z. Garcia, P. Kloser, Y. Sun, N. Megjugorac, P. Fitzgerald-Bocarsly. 2001. Decreased interferon-α production in HIV-infected patients correlates with numerical and functional deficiencies in circulating type 2 dendritic cell precursors. Clin. Immunol. 101:201. Chehimi, J., D. E. Campbell, L. Azzoni, D. Bacheller, E. Papasavvas, G. Jerandi, K. Mounzer, J. Kostman, G. Trinchieri, L. J. Montaner. 2002. Persistent decreases in blood plasmacytoid dendritic cell number and function despite effective highly active antiretroviral therapy and increased blood myeloid dendritic cells in HIV-infected individuals. J. Immunol. 168:4796. Soumelis, V., I. Scott, F. Gheyas, D. Bouhour, G. Cozon, L. Cotte, L. Huang, J. A. Levy, Y. J. Liu. 2001. Depletion of circulating natural type 1 interferon-producing cells in HIV-infected AIDS patients. Blood 98:906. Chougnet, C., T. A. Wynn, M. Clerici, A. L. Landay, H. A. Kessler, J. Rusnak, G. P. Melcher, A. Sher, G. M. Shearer. 1996. Molecular analysis of decreased interleukin-12 production in persons infected with human immunodeficiency virus. J. Infect. Dis. 174:46. Chehimi, J., S. E. Starr, I. Frank, A. D’Andrea, X. Ma, R. R. MacGregor, J. Sennelier, G. Trinchieri. 1994. Impaired interleukin 12 production in human immunodeficiency virus-infected patients. J. Exp. Med. 179:1361. Auffermann-Gretzinger, S., E. B. Keeffe, S. Levy. 2001. Impaired dendritic cell maturation in patients with chronic, but not resolved, hepatitis C virus infection. Blood 97:3171. Bain, C., A. Fatmi, F. Zoulim, J. P. Zarski, C. Trepo, G. Inchauspe. 2001. Impaired allostimulatory function of dendritic cells in chronic hepatitis C infection. Gastroenterology 120:512. Wedemeyer, H., C. Loos, J. Hadem, M. Bastuerk, M. Cornberg, B. Tegtmeyer, H. Liermann, N. Kezmic, H. L. Tillmann, M. P. Manns. 2002. Impaired cellular immune response after influenza vaccination in patients with chronic hepatitis C infection. Hepatology 36:276A. Wiedmann, M., U. G. Liebert, U. Oesen, H. Porst, M. Wiese, S. Schroeder, U. Halm, J. Mossner, F. Berr. 2000. Decreased immunogenicity of recombinant hepatitis B vaccine in chronic hepatitis C. Hepatology 31:230. Keeffe, E. B., S. Iwarson, B. J. McMahon, K. L. Lindsay, R. S. Koff, M. Manns, R. Baumgarten, M. Wiese, M. Fourneau, A. Safary, et al 1998. Safety and immunogenicity of hepatitis A vaccine in patients with chronic liver disease. Hepatology 27:881. Wedemeyer, H., X. S. He, M. Nascimbeni, A. R. Davis, H. B. Greenberg, J. H. Hoofnagle, T. J. Liang, H. Alter, B. Rehermann. 2002. Impaired effector function of hepatitis C virus-specific CD8+ T cells in chronic hepatitis C virus infection. J. Immunol. 169:3447. Chang, K., N. H. Gruener, S. Southwood, J. Sidney, G. R. Pape, F. V. Chisari, A. Sette. 1999. Identification of HLA-A3 and -B7-restricted CTL response to hepatitis C virus in patients with acute and chronic hepatitis C. J. Immunol. 162:1156. Scognamiglio, P., D. Accapezzato, M. Casciaro, A. Cacciani, M. Artini, G. Bruno, M. Chircu, J. Sidney, S. Southwood, S. Abrignani, et al 1999. Presence of effector CD8+ T cells in hepatitis C virus-exposed healthy seronegative donors. J. Immunol. 162:6681. Wong, D., D. Dudley, N. Afdhal, J. Dienstag, C. Rice, L. Wang, M. Houghton, B. Walker, M. Koziel. 1998. Liver-derived CTL in hepatitis C virus infection: breadth and specificity of responses in a cohort of persons with chronic infection. J. Immunol. 160:1479. Choo, Q. L., K. H. Richman, J. H. Han, K. Berger, C. Lee, C. Dong, C. Gallegos, D. Coit, A. Medina-Selby, P. J. Barr, et alGenetic organization and diversity of the hepatitis C virus. Proc. Natl. Acad. Sci. 88:2451. USA. Anthony, D. D., H. Valdez, A. B. Post, N. L. Carlson, P. S. Heeger, P. V. Lehmann. 2002. Comprehensive determinant mapping of the hepatitis-C-specific CD8 cell repertoire reveals unpredicted immune hierarchy. Clin. Immunol. 103:264. Wong, D. K., D. D. Dudley, P. B. Dohrenwend, G. M. Lauer, R. T. Chung, D. L. Thomas, B. D. Walker. 2001. Detection of diverse hepatitis C virus (HCV)-specific cytotoxic T lymphocytes in peripheral blood of infected persons by screening for responses to all translated proteins of HCV. J. Virol. 75:1229. Urbani, S., J. Uggeri, Y. Matsuura, T. Miyamura, A. Penna, C. Boni, C. Ferrari. 2001. Identification of immunodominant hepatitis C virus (HCV)-specific cytotoxic T-cell epitopes by stimulation with endogenously synthesized HCV antigens. Hepatology 33:1533. Sobao, Y., H. Tomiyama, S. Nakamura, H. Sekihara, K. Tanaka, M. Takiguchi. 2001. Visual demonstration of hepatitis C virus-specific memory CD8+ T-cell expansion in patients with acute hepatitis C. Hepatology 33:287. Olweus, J., A. BitMansour, R. Warnke, P. A. Thompson, J. Carballido, L. J. Picker, F. Lund-Johansen. 1997. Dendritic cell ontogeny: a human dendritic cell lineage of myeloid origin. Proc. Natl. Acad. Sci. USA 94:12551. Thomas, R., P. E. Lipsky. 1994. Human peripheral blood dendritic cell subsets: isolation and characterization of precursor and mature antigen-presenting cells. J. Immunol. 153:4016. Almeida, J., C. Bueno, M. C. Alguero, M. L. Sanchez, M. de Santiago, L. Escribano, B. Diaz-Agustin, J. M. Vaquero, F. J. Laso, J. F. San Miguel, A. Orfao. 2001. Comparative analysis of the morphological, cytochemical, immunophenotypical, and functional characteristics of normal human peripheral blood lineage−/CD16+/HLA-DR+/CD14−/lo cells, CD14+ monocytes, and CD16− dendritic cells. Clin. Immunol. 100:325. Kadowaki, N., S. Antonenko, Y. J. Liu. 2001. Distinct CpG DNA and polyinosinic-polycytidylic acid double-stranded RNA, respectively, stimulate CD11c-type 2 dendritic cell precursors and CD11c+ dendritic cells to produce type I IFN. J. Immunol. 166:2291. Forsthuber, T., H. C. Yip, P. V. Lehmann. 1996. Induction of TH1 and TH2 immunity in neonatal mice. Science 271:1728. Anthony, D. D., A. B. Post, H. Valdez, D. L. Peterson, M. Murphy, P. S. Heeger. 2001. ELISPOT analysis of hepatitis C virus protein-specific IFN-γ-producing peripheral blood lymphocytes in infected humans with and without cirrhosis. Clin. Immunol. 99:232. Karulin, A., M. Hesse, M. Tary-Lehmann, P. Lehmann. 2000. Single-cytokine-producing CD4 memory cells predominate in type 1 and type 2 immunity. J. Immunol. 164:1862. Ahmad-Nejad, P., H. Hacker, M. Rutz, S. Bauer, R. M. Vabulas, H. Wagner. 2002. Bacterial CpG-DNA and lipopolysaccharides activate Toll-like receptors at distinct cellular compartments. Eur. J. Immunol. 32:1958. Lore, K., M. R. Betts, J. M. Brenchley, J. Kuruppu, S. Khojasteh, S. Perfetto, M. Roederer, R. A. Seder, R. A. Koup. 2003. Toll-like receptor ligands modulate dendritic cells to augment cytomegalovirus- and HIV-1-specific T cell responses. J. Immunol. 171:4320. Dolganiuc, A., K. Kodys, A. Kopasz, C. Marshall, T. Do, L. Romics, Jr, P. Mandrekar, M. Zapp, G. Szabo. 2003. Hepatitis C virus core and nonstructural protein 3 proteins induce pro- and anti-inflammatory cytokines and inhibit dendritic cell differentiation. J. Immunol. 170:5615. Sarobe, P., J. J. Lasarte, N. Casares, A. Lopez-Diaz de Cerio, E. Baixeras, P. Labarga, N. Garcia, F. Borras-Cuesta, J. Prieto. 2002. Abnormal priming of CD4+ T cells by dendritic cells expressing hepatitis C virus core and E1 proteins. J. Virol. 76:5062. Patterson, S., A. Rae, N. Hockey, J. Gilmour, F. Gotch. 2001. Plasmacytoid dendritic cells are highly susceptible to human immunodeficiency virus type 1 infection and release infectious virus. J. Virol. 75:6710. Dobrovolskaia, M. A., A. E. Medvedev, K. E. Thomas, N. Cuesta, V. Toshchakov, T. Ren, M. J. Cody, S. M. Michalek, N. R. Rice, S. N. Vogel. 2003. Induction of in vitro reprogramming by Toll-like receptor (TLR)2 and TLR4 agonists in murine macrophages: effects of TLR “homotolerance” versus “heterotolerance” on NF-κB signaling pathway components. J. Immunol. 170:508. Harte, M. T., I. R. Haga, G. Maloney, P. Gray, P. C. Reading, N. W. Bartlett, G. L. Smith, A. Bowie, L. A. O’Neill. 2003. The poxvirus protein A52R targets Toll-like receptor signaling complexes to suppress host defense. J. Exp. Med. 197:343.